Sixteen mukhi Rudraksha represent the Mahakal form of Lord Shiva. Wearer of 16 faced is freed form the fear of Kaal(Death). It represents the victory and the possessor is never affected by heat or cold. The house in which 16 mukhi is kept is free from fire, theft or robbery. It protects the possessor from Navgrah Dosh. Possessor of this bead and chanting Mahamritunjay Mantra is always blessed by Lord Rudra. 16 Mukhi protects the wearer from various ailments and diseases. It is also called Jai Rudraksha and gives Victory at all Levels. Our seers advise us to keep these at Pooja altar and earn the grace of Lord Rudra. It invokes sixteen attainments of Moon in the wearer and open the passage for him. The wearer of this bead becomes the devotee of the almighty God and lives his life on the passage of truth and gains the goodness of seven births. Wearer of this bead, no longer remains an ordinary person , he will become a powerful person. 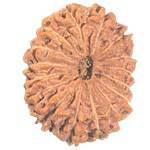 It is said that Arjuna strike the eye of fish while wearing this rudraksha.